Researchers from Western University have released footage of a basketball-sized meteor that was almost as bright as the full moon. 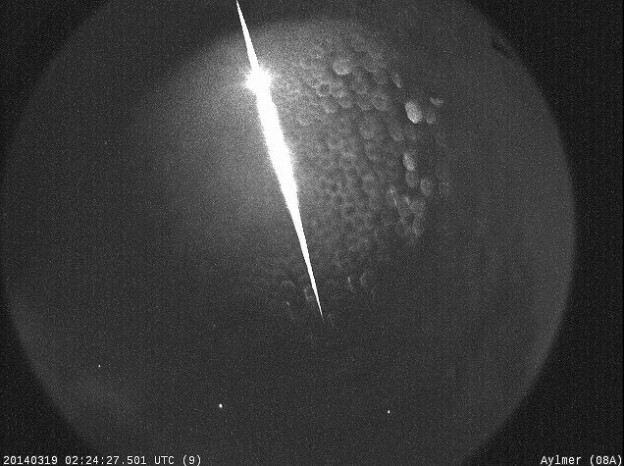 The meteor lit up the skies of southwestern Ontario last week. Astronomers are hoping to enlist the help of local residents in recovering one or more possible meteorites that may have crashed in the area just north of St. Thomas, Ontario. Meteorites may best be recognized by their dark and scalloped exterior, and are usually denser than normal rock and will often attract a fridge magnet due to their metal content. In this fall, meteorites may be found in a small hole produced by their dropping into soil. Meteorites are not dangerous, but any recovered meteorites should be placed in a clean plastic bag or container and be handled as little as possible to preserve their scientific information. The bright blue line in the diagram above shows the orbit of the Russian meteor prior to the meteor breaking apart over the city of Chelyabinsk. The meteor hit the atmosphere at a speed of 18 km/s (11.2 miles per second or 40,300 mph). It was moving at a shallow entry angle (less than 20 degrees) and broke apart some 15-25 km above the Russian city. Most of the damage was caused by the shock wave produced when the meteor disrupted. Several thousand meteors enter Earth’s atmosphere each day. The vast majority of these, however, occur over the oceans and uninhabited regions, and a good many are masked by daylight. Those that occur at night also are rarely noticed by people. Due to the combination of all of these factors, only a handful of witnessed meteorite falls occur each year. The Russia meteor was one of those rare instances.